The truth is that many home delivery software solutions were designed to either cover a broad range of industries or function perfectly for only one specific industry. For example, maybe one software will work great as a water delivery software but lacks what a meal delivery software needs. Delivery Biz Pro (DBP) is different. We know that a meal delivery is going to look different than a dairy delivery, and we know that your home delivery software needs to be tailored to your industry. We know that a local farmer making 100 deliveries a week will need something different than a propane business making 50,000 deliveries a week. With that in mind, we set out to create the best home delivery and routing software that is customizable and able to be tailored to your industry and your needs. So, what makes our software better than the other delivery software options out there? When we started Delivery Biz Pro, we knew we wanted to create the best delivery software on the market that responded to all the “buts” you had about other software solutions. When you say, “This is good, but it could be better for me,” we address that “but” with a solution. One way we have done that is by making our software completely customizable. We have given you a comprehensive suite of administrative tools to use pretty much however you want, so you have control over how your customers browse your site and order items and how those products are delivered. 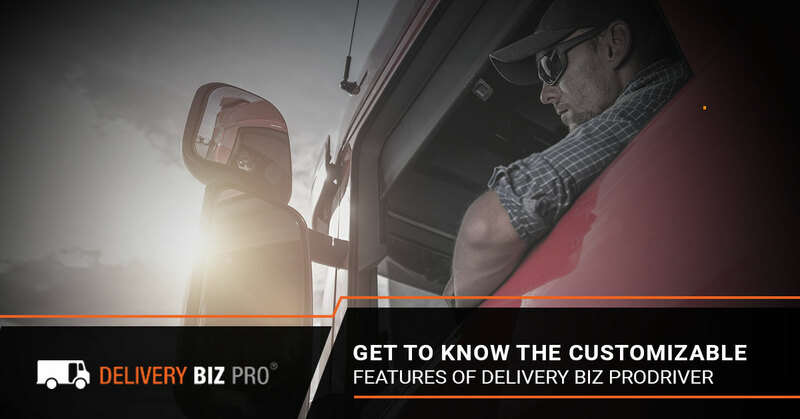 Below, we’re going to discuss just a handful of ways you can customize your delivery software when you use Delivery Biz Pro. Sometimes customers forget that they’re going out of town and need to cancel a delivery the day-of, and sometimes customers want to place an order after your driver has already left the building. Our software allows drivers to customize their experience as well, by altering routes based on time, deleting deliveries, taking new orders, and collecting payments. Your drivers are essential to your business, and equipping drivers with intuitive software allows your company as a whole to provide excellent service to your customers that goes above and beyond simple orders and deliveries. Like we mentioned above, what if customers want to change their order the day that their delivery is scheduled? If it works for your business, you can set an order cut-off time. Whether that is at midnight the day before the delivery is scheduled or 7:00 am or even noon after the driver has already left. If you have a water or propane delivery business and your drivers frequently carry extra inventory, then customers might be able to adjust their orders later (and this will alert drivers of changes, as well). If you have a meal delivery business where each box needs to be packed to the customer’s specifications, then you might need to make the cut-off a couple days before the delivery is scheduled. Again, this is customizable to work for your industry. And, of course, customers can also still shop for upcoming orders, but having this feature makes their deliveries more predictable. Ready To Get Started With One Of The Most Customizable Delivery Softwares On The Market? Click Here! If a customer forgets they have a dairy delivery scheduled, they might forget to put a cooler on their front porch for the drop-off. This means the driver must decide to withhold their delivery or risk the customer showing up to spoiled milk — either way, it is likely to lead to an unhappy customer and a negative review. If your business and customers would benefit from order and delivery reminders, then you can easily set up the system to allow that. Customers can opt-in and choose their own reminder intervals (say, three days before, one day before, and day-of), and the system can send them an alert when their delivery has been dropped off. Do you want your drivers to make drop-offs based on the time it will take to get from house to house or the physical mileage between destinations? Do you have deliveries made all over the city based on the day of the week? Or do you need a way to create routes based on neighborhoods? However you want to route your customers, our delivery routing software can do it with the press of a few buttons. We know that home delivery businesses will need to schedule and assign routes in different ways based on their business model. Our system allows you to assign customers to routes by doing something as simple as drawing a circle on a map or you can allow your customers to choose what day they want their items dropped off and go from there. You can even assign the same customer to multiple routes or have your drivers use a drag-and-drop feature to change routes on-the-go. Certain recurring home delivery industries rely on customers returning the containers their product came in — whether it be glass milk bottles, plastic water jugs, or propane tanks. However, the most customers you gain, the more difficult it becomes to keep track of who has what containers and who has returned them. Our software recognizes this and has customizable features in place to help drivers mark who left rinsed milk bottles on their porch and who hasn’t returned the last three propane tanks that they were delivered. With our delivery management software, your drivers can keep track of what has been returned and what hasn’t been and which customers have outstanding items. You can then determine whether or not you want your software to send reminder emails to those customers who could use a little nudge to get those milk bottles back. At Delivery Biz Pro, we are committed to helping you get the most out of your delivery software. From order management to routing, you can count on us to be here for you! Our software offers a lot of features (seriously, this isn’t just the tip of the iceberg, it’s a little ice cube floating next to the iceberg), and we are more than happy to get you set up with the features you need without overwhelming you with the ones you don’t. We’d love to spend some time getting to know you and your business model to determine how DBP can help your business grow. Get in touch with us today and we’ll schedule a time to chat about the difference a customizable delivery software can make.